The C-section rate, btw, should be under 5%. That would account for medically necessary C-sections, which are relatively rare. Instead, it is 32.9%. This poster doesn’t mention that women with private insurance are much more likely to receive a C-section than women on Medicaid, because the pay-out is so much higher, and also that the rate of “emergency C-sections” spikes at 5pm and on holidays. And that people are routinely subjected to treatments like induction that dramatically raise the risk of C-section without being informed of the risks. The c-section rate should NOT be lower than 5%. Where in the world are you getting a number like that? Even WHO recommends 15% — did you just drop the 10 there? Is that a typo? 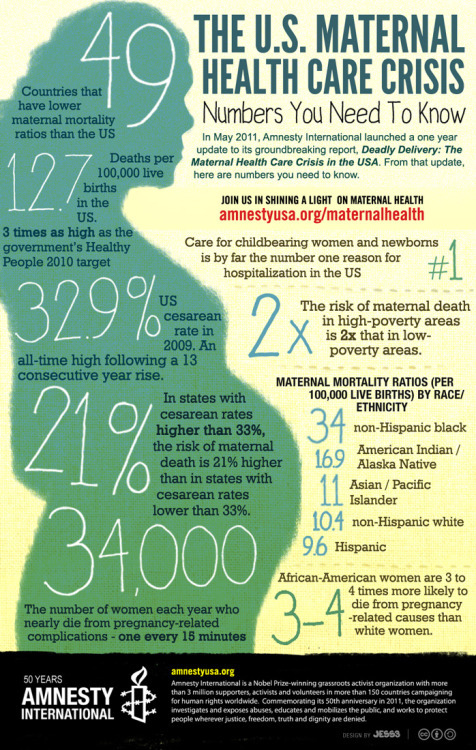 Additionally, there are studies that show the higher-than-normal c-Section rate in this country is NOT due to knife-happy doctors “looking to make their golf game”, but rather to the high-level of obstetric care in this country that allows high-risk pregnancies to MAKE IT to the labor stage. Many of these women who end up having c-sections are women whose pregnancies would not be viable in places with lower standards of prenatal care. They would have miscarried with faulty placentas, unfavorable cervices, GD, Pre-E, infertility, multiples, blood type incompatibilities, bad outcomes in previous pregnancies, diabetes, advanced maternal age, and any number of other high-risk pregnancy complications. Instead, their pregnancies made it to term and their doctors AND the patients might choose not to add further complications to the mix by placing them through a dangerous trial of labor. Do more research and fix your numbers. A C-Section isn’t the worst thing that can happen to a pregnant mother. The death of her baby and herself ARE. While some cesareans might be done a bit earlier than warranted, the majority of them are NOT. And even though there is a risk of wound infection and bleeding, as a rule, people, neither mothers nor babies die from cesareans. Also, fuzzy thinking on the statistics part. Just because states with high cesarean rates also have high rates for maternal death does not mean that the mothers die because they had a cesarean. It’s like saying that if in a country, the stork population decreases and birth rate decreases too, that’s proof that storks bring babies (when it’s industrialization which is the real reason for both).